Wrapper: Ecuadoran Sumatra. Filler: Honduran, Nicaraguan, Dominican (Piloto Cubano). Binder: Connecticut Broadleaf. Country of Manufacture: Honduras. Factory Name: Honduras American Tabaco S.A., Cofradia, Honduras. -- The history: The original Hoyo de Monterrey was the 1865 inspiration of Jose Gener, one of the most respected growers in Cuba's famed Vuelta Abajo. Since the early 1970s, an equally illustrious Hoyo de Monterrey tradition has been firmly established in Honduras under the masterful guidance of cigar master Estelo Padrón. In its own full-bodied way, the Honduran Hoyo de Monterrey is, in the judgment of many, more Cuban in character than the Cuban Hoyo. The cigar: An authentic Honduran cigar from its head to its tuck, Hoyo de Monterrey is crafted with Cuban-seed tobacco carefully cultivated in the richest Honduran soil. Made "en la manera de los Indios" (the Indian way) the Hoyo de Monterrey cigar is still simply a product of the sun, the wind, and the soil. The experience: A full-bodied cigar of straightforward character, Hoyo de Monterrey invites you to enjoy the standard for all Honduran cigars. i would rate this cigar as full bodied with a strong aftertaste. an evening smoke with a good brushing of the teeth afterwards. On lighting up you obtain a great even burn with tonnes of toast and earth the smoke is powerful with a blue glow as you smoke on it becomes warm and creamy with chocolate and truffle tastes an even burn leads to the last inches which are strong woody earthy on tbe pallet but throughout the smoke is cool and refreshing with great aromas in the room.I finish of the last of the cigar in my pipe reliving the moment a little longer. 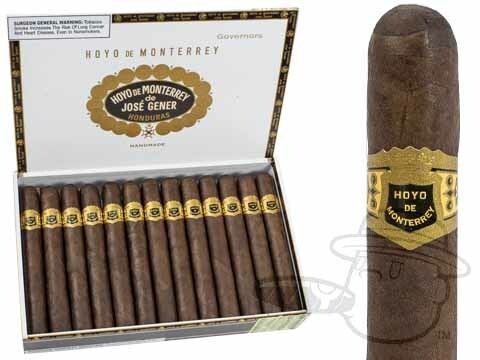 Hoyo De Monterrey Governors Maduro is rated 5 out of 5 based on 2 customer ratings.